Life has a way of responding to intentional thought in interesting ways, and sometimes it takes me by surprise, as was the case on one unseasonably hot afternoon. 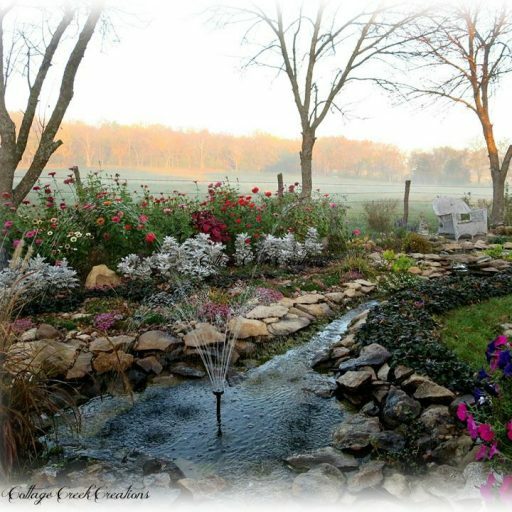 On the morning of that particular day, I had created an inspirational picture (above) from an image that I had taken in the Cottage Creek garden. Melding beautiful images with inspiring words is one of my very favorite, most soul satisfying things to do. The process is much like a meditation, bringing with it a sense of reflection, personal inspiration and peace. The creative project had begun as a thought around how dramatically even a simple act of kindness can impact someone’s life. I found myself remembering some of the lowest points of my own life when kindness from others made all the difference. Often, it has been the smallest gestures, offered during a particularly pivotal moment, that have been the most meaningful. And it is likely that the person, who showed the kindness, was unaware of how impactful it was for me. 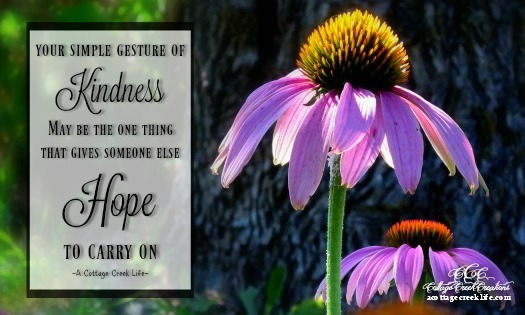 Those acts of simple kindness brought big hope and the emotional renewal to carry on. After finishing the picture, I felt an inner resolve to approach the day with an intentional mindset of kindness. That afternoon, while running errands, I pulled into the local Target parking lot and opened the car door to a wave of heat that was reflecting off the pavement. The forecast, for record high temperatures, was presenting an unwelcome wrinkle due to my vehicle’s malfunctioning air conditioner. The plan was to make a quick stop, with barely enough time to make another appointment. Sweat was rolling down my face, and I felt like an extremely frazzled, hot mess! With eyes glued to the front doors of the building, I couldn’t get into the store fast enough (where I knew coolness and an iced coffee would await). So, I shook my head ‘no’ and offered a quick, “I’m sorry”. By that point, the couple had come close enough for me to see the beads of sweat on their foreheads and the look of defeat on their faces. I walked onward, but just before stepping into the coolness of the store, my heart overruled my brain’s self-centered decision. In that moment, I remembered that (some time ago) I had tucked a small amount of cash in a pocket, underneath my phone, ‘in case of emergency’. I checked to make sure that it was still there and then turned around to find the couple. I spotted them at the end of the lot. Apparently, they had not found anyone else to help and were moving to a new location. I yelled to them from across the hot concrete, motioning for them to wait for me. Running to met them, I wiped the sweat from my brow and smiled broadly as our eyes connected. I have never seen such relieved expressions on two faces! A blissful feeling washed over me, as I began to comprehend the power in that moment. The intense awareness of my own stress had vanished with the obvious outcome of the simple gesture of compassion. I knew that a few dollars and (perhaps more importantly) the simple act of human interaction and kindness had made a big difference for two people. How many times had the couple, in desperation, swallowed their pride to ask for help…only to be turned away? Hope is critical to survival. When people find themselves standing on the edge of hopelessness, it is an extremely frightening, lonely, and very dark place. Experiencing life from that vantage point can mean that self-esteem and confidence is lost. Any expectation for something better fades into a dim memory from some distant time or into a false belief that good things will only happen to other people. Many times, people begin to believe that they are being punished for some imagined offense and that God is out to get them. I can only imagine what the repeated experience of rejection (from others) does to those who are in such a fragile and vulnerable position. Kindness translates as validation. When we take the time to look someone else in the eye and meet them with a genuine, warm smile, it says, “You exist. You have value. You matter. You are worthy of kindness.”. It can be the spark that illuminates a corner of their darkness and it can quench emotional thirst, providing a measure of relief. Kindness holds a secret psychological promise that “It’s all going to work out in the end”. Isn’t that the truest place from which hope springs? The expectation that we will get through a hard spot, finding something better at the end, is what drives us to keep trying. People who knock on the door of hopelessness are ready to abandon that belief. Kindness from others can be perceived as an affirmation that there is possibility for better days ahead. Kindness can send the powerful life-giving message that “a force that is greater than themselves is watching over them”. People, who find themselves in desperate situations, feel utterly helpless. The reality of their own limitations comes vividly into focus. My own belief in a loving God, who would carry me through unspeakable hardship, has been crucial during the most difficult parts of my life. There have been many moments throughout my life when I have wondered how I could have survived the difficulty without faith, such as the times when I walked through the valley with a serious health crisis, or when I dealt with my brother’s violent and tragic death by gunshot (story in future post). It is through the darkest hours of life, when people feel utterly lost and alone, that they most need to lean on divine Love. When we are able to be fully present and relate with others in a loving, intentional way, it is possible to be the “glue” that holds a hopeless soul together. It is possible that, by looking a stranger in the eye and greeting him/her with a warm smile, it might help ignite a spark of worth that could emotionally help get that person down the road a little further. There is no way for us to truly understand someone else’s experience of life. There is no possibility for us to see the moments that have culminated into someone else’s lifestyle…or to comprehend how their experience of the world’s response to their suffering continues to impact their life. It is, also, entirely too easy to stand from a distance, making harsh and unjust judgments that are based on our own lack of understanding, which often keeps us from responding to great need with kindness, respect and generosity. And it is far too easy to get lost in our own struggles, which blind us to the greater need around us. On that hot afternoon, as I made my way back to the car, I watched the couple disappear from my view. He, carrying a case of water on his shoulder. She, a small bag of groceries in her hand. My prayer was that the simple act of kindness would translate into big hope for them, and that I would remember the lesson that Love had chosen to teach me that day. Were you ever touched by a simple act of kindness from someone? Or do you have a story of a time when you were able to extend the same to another? I would love to hear about it in the comments below. Be kind and have courage is my motto for life. Not everyone is kind but the choice to be kind takes courage. I love your motto, Ruthie! Thanks for sharing it with us.